It is simply that on July 10th Zygmunt Jan Rumel – the envoy of the Polish government in Volyn, who tried to hold negotiations with Banderists over the peaceful settlement of the conflict – was killed, and on the next day (July 11th) UPA attacked over 150 Polish villages at the same time. It is precisely from this day onwards that hope for some form of compromise settlement in Banderist-Polish contradictions was lost and events definitively took the form of the mass genocide of Poles. In recent years the history of the Volyn massacre is described in all details. The refusal of Kiev to admit the guilt of Banderists in the genocide of Poles in Western Ukraine became the reason for a sharp political conflict between modern Ukraine and Poland, which is far from being exhausted and still hasn’t reached its peak. I want to especially highlight that it is thanks to the inadequate policy of the current Ukrainian authorities that the old half-forgotten Banderist-Polish conflict became an actual Ukrainian-Polish one. I.e., the modern Ukrainian State and its people, without there being any need to do so, assumed responsibility for the actions of monsters 75-years ago. After all, Kiev was only required to condemn absolutely obvious criminals who committed crimes against humanity, to distance themselves from them and thus close the question. But the authorities decided that the formal Ukrainian-ness of murderers can turn criminals into heroes. This is now already common Ukrainian guilt and common Ukrainian shame, and whitewashing this will not be simple at all. Actually, the official government of the country, with the full non-resistance and even partial support of the people, at the high international level declared that from its point of view the murder of unarmed people – mainly women and children – is justified if it is done in the interests of Ukrainian statehood. Now the Ukrainian authorities are sincerely surprised by the Polish reaction. After all, they quite recently said (and did) the same thing concerning Russians and received the hot approval of the collective West, and Poland in particular. Naive Ukrainian leaders decided that “if there is no Nazism in Ukraine” when it is aimed against Russians, then it “won’t exist” concerning the Poles too. Now they accuse the West and Poland of double standards. After all, the standards are, of course, double, but nobody especially tried to hide this. There was a need to take this into account when developing domestic and foreign policy. Pathological russophobia is an indulgence in the opinion of the West only if crimes are committed against Russians. But it doesn’t mean at all that the West is ready to tolerate the same thing in relation to itself. Once, even before the collapse of the USSR, the president of a Croatia that had just declared its independence Franjo Tuđman came to Kiev on a visit. Now that he has long been dead, and Croatia tries to obtain a “human face”and turn into a “normal democracy”, even the West tries not to remember his regime as being too dirty to shake hands with. But back then the establishment of a totalitarian dictatorship and the ethnic cleansing of Serbians were still ahead, and Tuđman was considered to be a democrat dissident. In the schedule of Tuđman’s visit to Kiev there was a speech in front of university students. In his speech he called Croatia “the Ukraine of the Balkans”. The parallel was clear enough. Croatians don’t like their Serbian “elder brother”in the same way that Ukrainians don’t like their Russian one. It is necessary to say that as of that moment Tuđman was deeply mistaken concerning Russian-Ukrainian relations. 25 years of extreme propaganda were needed in order to bring the matter to the Russian-Ukrainian civil war in Ukraine. But even now, if not to take into account the several tens of thousands of ideological descendants of Banderists, in the broad masses of the population there aren’t any of those who have become gripped by the pathological hatred that forced Croatians to invent the “srbosjek“ in the years of World War II, and at the beginning of the 90’s to stage the most large-scale ethnic cleansing on the European continent in the last 70 years. Indifference and apathy are quite characteristic for the citizens of Ukraine, thanks to which the pathetic 1% of the total number of the population can stage maidans, launch war in Donbass, and in the end – exterminate their own State. And here we arrive at the second mistake of Tuđman. He overestimated the common sense of Ukrainian nationalists, who already back then were actively moving into power in Kiev. Let’s look at the same Croatia. Croatians don’t like not only Serbians. If the Americans didn’t forbid them, they would commit genocide against Bosnians too. They also can’t forgive the Hungarians for the fact that in 1102 Coloman the Learned liquidated the independent kingdom of Croatia. After this only Hitler in 1941 allowed the creation of an independent Croatia. So in general, in the same way as Ukrainians, Croatians, should they have the desire, could turn their nationalism against their neighbors. But they preferred to concentrate on Serbians, because it is impossible to create a State if all your neighbors are enemies, since they will suffocate it in its cradle via collective efforts. During this same speech at the Kiev university, Tuđman, answering a question about his attitude towards Tito – someone who he was an irreconcilable political opponent of, said: “Tito, of course, was a communist, but he was Croatian”. This is another noteworthy point. Croatian nationalists, even such radical ones as Tuđman, were able to restrain their ardor not only in foreign policy, but also in the domestic political arena. Being in conflict with the large Serbian community that they finally were able to force out beyond the borders of Croatia, they tried to avoid other serious conflicts, including for ideological reasons. Only thanks to this did they manage to create a State in rather difficult conditions. Even in the West there was no consensus concerning the expediency of the disintegration of Yugoslavia at the beginning of the 90’s. It is Germany that acted as the locomotive of the process, but there was no guarantee that it would manage to convince its partners in the EU and that the Americans, who Milosevic quite suited at first, would agree to it [disintegration of Yugoslavia – ed]. I.e., the external situation didn’t favor the builders of an independent Croatia. Inside the country, as was already said, there was a strong Serbian community that compactly lived on its historical lands, and which sought to maintain State unity with Serbia. If in these conditions the Croatians started laying down historical claims to all its neighbors, and inside the country a witch-hunt on ideological grounds would be arranged, then independent Croatia would disappear without having ever appeared. This is exactly what Ukrainians did. Having received independence on a plate and having a quite loyal population, nationalists immediately started to create lines of division in society. Either a pathetic small group of Galician-speaking enthusiasts tries to “Ukrainise” (or to be more exact – Galicianise) all of Ukraine, 83% of which speak Russian, or a small group of “fascistising” marginals try to impose Bandera and Shukhevych being heroes on the grandchildren of the winners [Red Army – ed], and to almost present collaborators from OUN and UPA as the only winners in World War II, during which they allegedly fought against both Germany and the USSR. It is clear that all of this didn’t make them more popular inside the country. That’s why they were able to come to power only via a coup and remain in power only via open violence: arbitrary arrests and murders. Naturally, they see their main enemy as Russia, just because a Russophobic regime that also openly calls the West for war against Russia can’t please Moscow. It would be logical to expect that Kiev will try not to irritate other neighbors (Poland, Hungary, Romania, Moldova, Belarus). After all, the strongest internal conflict multiplied by disgusting relations with Russia, which definitively declared itself as a superpower, already practically doesn’t give the Ukrainian state any chances of succeeding. But the Ukrainian leadership went in another direction. It managed to attack literally all ethnic minorities, to touch the sore points of literally all their neighbors, and to make the idea of partitioning Ukraine extremely popular in the Eastern European countries that border it. Moreover, by trying to acquit Banderists for the Volyn massacre, Kiev put forward the concept of a local Ukrainian-Polish war in Volyn. The Ukrainian point of view is that in the region there were clashes between UPA and Armia Krajowa, a by-product of which were attacks on Polish and Ukrainian settlements as potential places of basing enemy forces. But this in its root contradicts the legend of the simultaneous fight of Banderists against Hitler and Stalin. Armia Krajowa was subordinated to the Polish government in exile in London and was equally negative about both Berlin and Moscow. Here, it would seem, is a natural ally in the “fight” on two fronts, which was allegedly carried out by Banderists. But instead, UPA, relying on the support of the Nazis who they allegedly are at war with, massacred with rapture the Poles who are actually at war with the Germans. This isn’t just the full collapse of the legend about UPA being an anti-Hitler force. 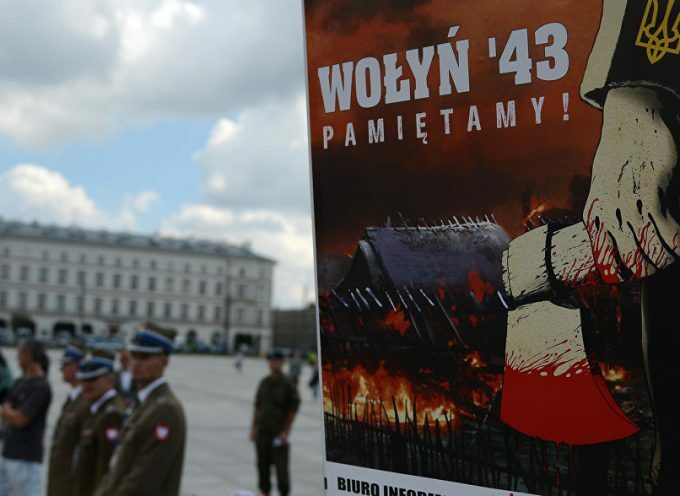 The fact is that by entering into a senseless and doomed in advance discussion with the Poles, Ukrainians stimulate the national memory of the same Poland. Moreover, they force Warsaw, defending its position in the international arena, to actively release into the public domain documents and materials about the true nazi and collaborationist essence of OUN and UPA. I will emphasise that Poland, which for a long time pretended that it doesn’t see the development of Nazism in Ukraine, is now forced to support the Russian position that Warsaw earlier tried to ignore and even disavow. The long-term propaganda activities of Poland based on a mass of real documents are much more dangerous for Kiev than Hungary’s demonstrative blockade of events in NATO and the EU with the participation of Ukrainians, as well as the feeble efforts of Romania to return the territories that it lost in 1940. Hungary will withdraw its objections when Kiev becomes reasonable and stops threatening the Hungarian community in Transcarpathia. I.e., the key to an instant solution of this conflict is in the hands of Kiev, and as soon as Ukraine satisfies the fair demands of Budapest the conflict will be settled without any political consequences. Romania alone doesn’t constitute a danger and can’t dream about lands for at least another 100 years. But Poland’s forced exposure of the true essence of Ukrainian nationalism will have long-term consequences that are harmful for Ukraine. Once launched, the propaganda machine can’t be immediately stopped. Poland has positioned itself as the “lawyer of Ukraine” in the EU and NATO for too long. In the West there is the opinion that Warsaw’s politicians have a better grasp of the Ukrainian perspective than their colleagues from other European countries. If Russia isn’t trusted very often and is suspected of forging aggressive plans, then Poland is excluded from suspicions. If Poland affirms that in Ukraine the ideological followers of the collaborators who served Hitler are today in power, then it means that this is indeed the reality. And suddenly in recent months articles written by journalists who “started to see clearly” and discovered Nazism in Ukraine started appearing in the western press one after the other. I think that the information activities of Poland very much assisted in such “enlightenment”. Its indirect result is that the West is obliged to recognise with shame that Russia, which already for the 5th year has pointed out the nazi essence of the Kiev regime, appeared to be right. And now the Poles — the main western specialists on Ukraine – also confirmed it. And further there is a logical question: so maybe Russia was right about everything else too? After this Kiev even dares to be surprised that Merkel so desperately fights for “Nord Stream-2” and the Bulgarians dream of returning to the construction of South Stream. After all, if in Kiev it is indeed nazis who are in power, and Russia is right about everything, then it is for sure that Europe can’t cope without the [gas – ed] “streams”. After all, Europe isn’t Ukraine, and it doesn’t plan to buy “reverse” Russian gas from China extremely expensively. In general, by glorifying Nazis under the applause of the West to spite Russia, Ukrainian politicians, due to their narrow-mindedness, decided that if the US and NATO are against Russia and Hitler was against Russia, so public solidarisation with Nazi lackeys from OUN and UPA will be met in the West with approval. Having rushed to the gaping heights ahead of the locomotive, Kiev, as is usually the case for it, deceived itself. Along the way, Ukrainian statehood once again practically lost any chance of being successful. A regime that is officially recognised as being Nazi – and everything is heading towards this [vis-a-vis the junta in Kiev – ed] – isn’t needed by anybody neither in Europe nor in the world. Even by those who share the views of Adolf. Having split and submerged their own country in civil war, nationalists now hammer the last nail into the lid of its coffin, ensuring international isolation for Ukraine.